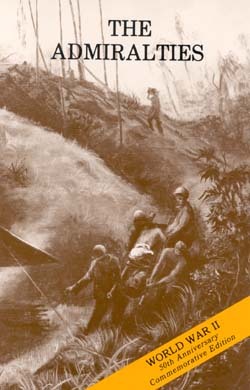 The Admiralties: Operations of the 1st Cavalry Division (29 February -18 May 1944) is one of a series of fourteen studies of World War II operations originally published by the War Department's Historical Division and now returned to print as part of the Army's commemoration of the fiftieth anniversary of that momentous clash of arms. These volumes, prepared by professional historians shortly after the events described, provide a concise summary of some of the major campaigns and battles fought by American soldiers. The skillful combination of combat interviews with primary sources, many of which are now lost, gives these unassuming narratives a special importance to military historians. The careful analysis of key operations provides numerous lessons for today's military students. AMERICAN FORCES IN ACTION SERIES presents detailed accounts of particular combat operations of United States forces. To the American public, this record of high achievement by men who served their nation well is presented as a preface to the full military history of World War II. To the soldiers who took part in the operations concerned, these narratives will give the opportunity to see more clearly the results of orders which they obeyed and of sacrifices which they and their comrades made, in performance of missions that find their meaning in the outcome of a larger plan of battle. The Admiralties: Operations of the 1st Cavalry Division, 29 February - 18 May 1944, is the eighth of a series called AMERICAN FORCES IN ACTION. This study was prepared by the Historical Division from the best military records available. Although in its published form the book contains no documentation, the original manuscript, fully documented, is on file in the War Department. Photographs are from the following sources: U.S. Army Signal Corps (pp. 22, 24, 25, 27, 32, 35, 42, 49, 70, 72, 73, 83, 94, 110, 136, 139); U. S. Army Air Forces (pp. 16, 72, 86, 106); 8th Engineer Squadron (pp. 68, 88, 91, 98, 101, 130, 138, 147); U.S. Air Transport Command, Overseas Technical Unit (pp. 5, 58, 119, 145); Acme Newspictures, Inc. (pp. 26, 28, 52, 112, 121); U.S. Navy Department (p. 135). The photographs from Acme Newspictures, Inc., may not be reproduced without the approval of the War Department. Readers are urged to send directly to the Historical Division, War Department, Washington 25, D. C. all comments, criticism, and additional data which may help in the preparation of a complete and definitive history of the Admiralties operation.